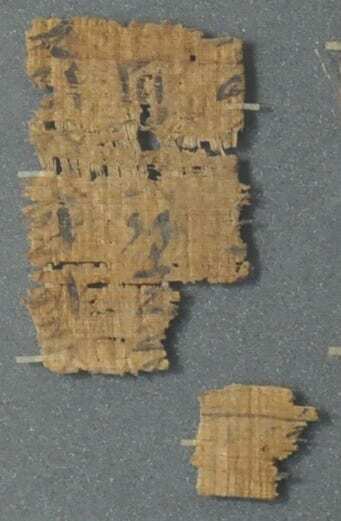 Since the last blog for the Papyrus for the People project, the conservation work on the Petrie Museum’s papyri has been progressing steadily and strongly. So much so, that it is nearly over! In light of this, I would love to share with you two of my favourite fixes that have occurred during this work. When this frame came in for conservation, there seemed to be little to do, as both the glass and the hieratic papyri fragments were in good shape. It was expected to be a quick and easy re-taping job. However, upon further inspection, it was noted that one of the previous curators (Stephen Quirke) had identified two separate fragments that he believed would join together. So, from this information, I created the diagram below and asked Vania Assis, our papyrus conservator, to see if she could fit them together and make space for the larger fragment in the re-taping process. Wonderfully, this was fully possible and it was really interesting to find out that even without the curatorial information, Vania would have noticed that these two fragments went together as their fibres lined up perfectly. If your eyes are especially keen, you can see in the pictures below how the ink from the bottom letters of the top fragment flows directly into the fragment below. Can you spot the seam? The next conservation marvel, involved a papyrus that in comparison to the first frame, needed a bit more TLC. 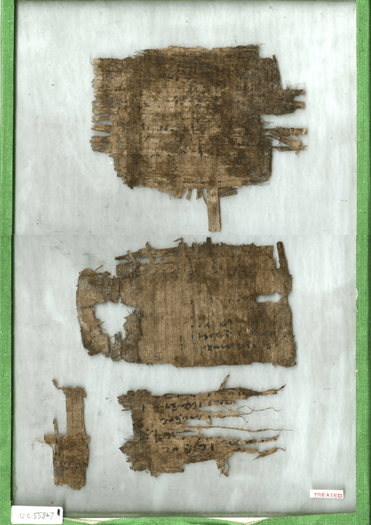 The tapes were torn and the papyri were not properly attached to the glass panels. 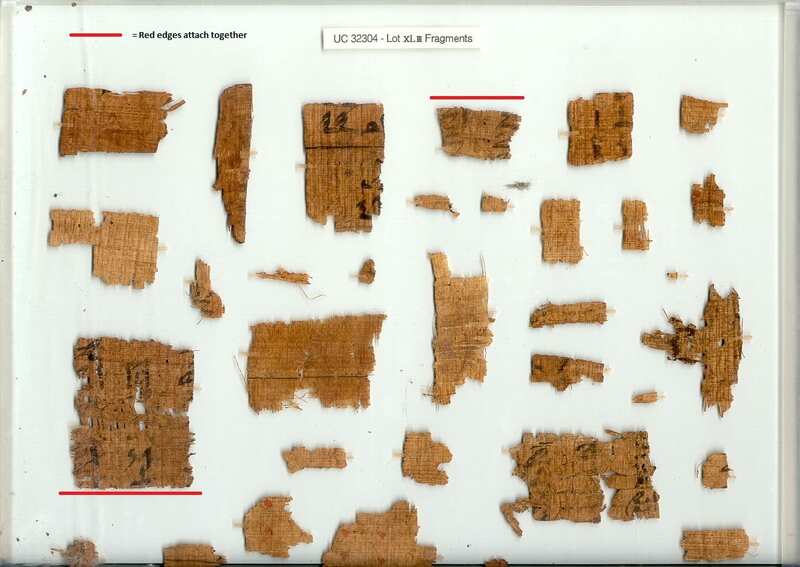 These demotic fragments look rather different to the previous papyri, because they were once part of a cartonnage object. Cartonnage, is a sort of paper mâché that the ancient Egyptians used to create highly decorative face masks and foot casings for their burials. 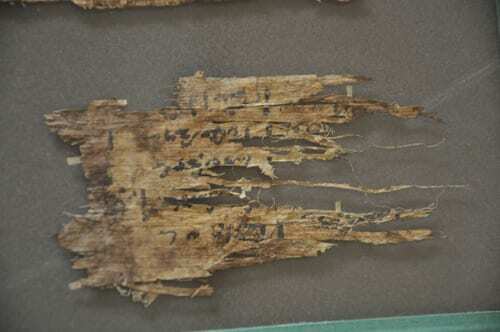 Therefore, papyri from cartonnage is often darker than those which have been found loose, as they have absorbed resins and oils from burial processes. It also often has white plaster remnants, which come from the original painted decorations. Once Vania worked her magic, these fragments looked right at home in their new frame. More importantly, Vania noticed that one of the fibres had previously been folded over in the old glass. Carefully laying the strands out, she realised that a whole new line of text had been revealed! Unfolded for the world to see. These are just a couple of examples of the extraordinary work that has been done in the conservation aspect of the Papyrus for the People project. We are exceptionally grateful to our conservator, Vania Assis, for all the time and effort she’s put in to making these objects safe, stable and looking their best. We are really looking forward to showing off all the other papyri that have been conserved this year, so keep an eye out for our upcoming events, where we will be exploring some more of them in depth. The Designation Scheme recognises, celebrates and champions significant collections of national and international importance held outside national museums. Awards of Designated status are made by an independent expert panel, based on the collection’s quality and significance. The 2016-18 round of the Designation Development Fund is investing £1,330,849 to support projects that ensure the long-term sustainability of Designated museum collections. The Designation Development Fund recognises the importance of excellent collections and provides funding for projects that ensure their long-term sustainability, maximise their public value and encourage the sharing of best practice across the sector. In this round, we will focus on opportunities around research and understanding of Designated collections. Louise Bascombe is the Curatorial Assistant working on the Papyrus for the People Project at the Petrie Museum of Egyptian Archaeology.